I’ve recently been involved in a lot of conversations about parenting and was captivated by the comment that it’s a “life sentence.” I can think of worse ones, but it does have its ups and downs. Whether one becomes a parent through giving birth or adoption, the duration of the relationship is, indeed, lifelong. When you then consider the hoped-for progression of grandchildren and, if you’re lucky, great-grandchildren, filling a parent’s life, the reality of the lifelong commitment becomes clear. Nobody ever said parenting is easy. Somehow offspring have a way of surprising parents. At lease that’s been my experience. An unexpected tattoo. Moving out when least expected. Moving back in when least expected. Relationship choices. Education choices. Sadly, tragedies insert themselves into families–the crisis of illness and the grief of loss. Through it all, the heart remains steadfastly invested in the relationship of parenting. 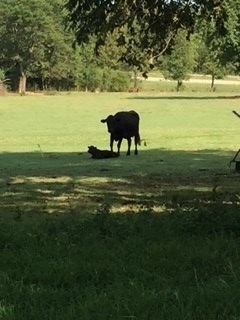 I looked out today and saw the two-day-old calf with it’s mother. I failed to catch a picture of it nursing but just stood and watched for a minute as it situated itself between the two adults. How special it is when a young person has more than one older adult to follow! I know my children and grandchildren have been blessed by teachers and church family and adult mentors. 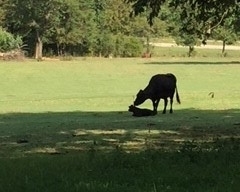 Then the mother cow turned to caress her baby with her tongue. A portrait of maternal instinct and love. I am blessed to have great-grandchildren now. Children are good, grandchildren are grand, and great-grandchildren are great. My heart swells with love for each generation. I’ve found the maternal instincts only grow stronger. Perhaps because of greater maturity. 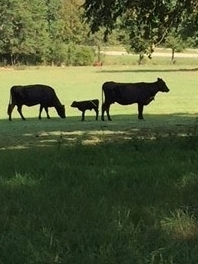 Perhaps because one recognizes that not everyone experiences the blessing of multigenerational families. Even now I recognize in my 92-year-old mother evidence of her daily desire to be assured that I am healthy and safe and happy. May God bless your family through you! Kathy, I’ve been privileged to know you and see you love your children, grandchildren and now great-grands. You are a model of love and example of faith to all of them. I do raise up to praise your efforts and call you blessed. Thank you! Each adds a new facet to life! So special!